This study examines the political role played by the ulama, or learned men, during the Anwar Sadat era (1970-1981) at the al-Azhar University in Egypt, which is one of the oldest centers of science in the world. Within the larger framework of the political developments that took place in Egypt in the 19th and 20th centuries, the author focuses on the positions the ulama took and the changes that occurred at al-AzharUniversity. 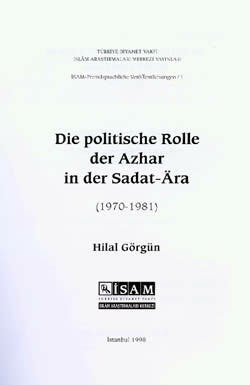 Following the historical background, the book analyzes the views the ulama at al-Azhar held regarding the major political events that the whole country was concerned with when Anwar Sadat was the President of Egypt (for example, the implementation of the Shari‘ah, various political currents, the Palestinian problem, peace with Israel, and the Muslim unity) as well as the solutions the ulama proposed to deal with these difficulties.